The homeless are often negatively stereotyped, but one student at Meadowridge School, British Columbia, Canada, has set out to dispel people’s prejudices. 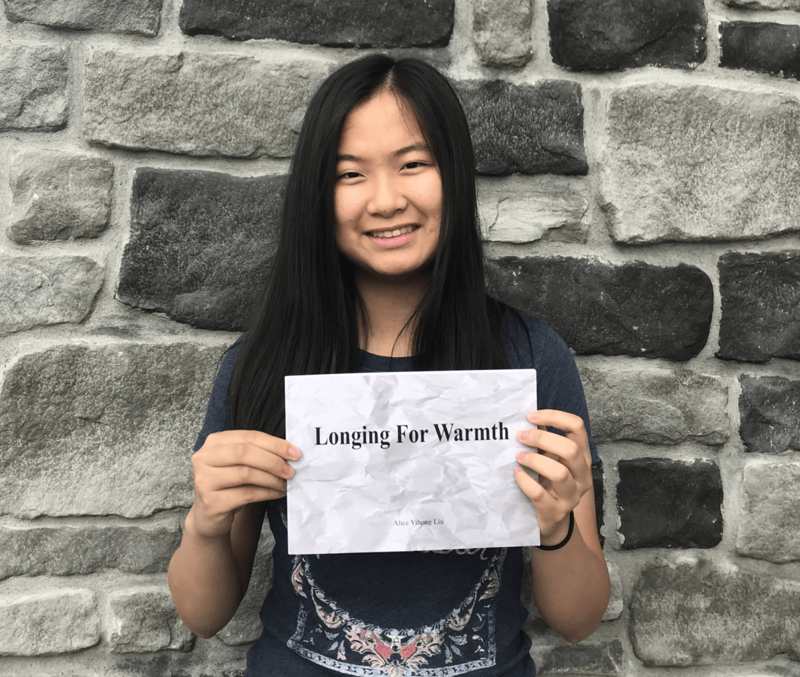 For her Middle Years Programme (MYP) personal project, Alice (Yihong) Liu interviewed homeless individuals and created a book called Longing For Warmth. “When I was younger, I saw homeless people as those who are simply too lazy to find a job. However, as I grew up, my interactions with homeless people increased and I realized many of them are well spoken and kind. I know there are many people that hold similar views as my younger self”, explains Alice. “This inspired me to learn more about the lives of those who are homeless and change how others view them through my personal project”. Alice conducted 12 interviews on the streets of Port Coquitlam, her hometown, and at The Salvation Army Ridge Meadows Ministries. In town, she held up a sign asking homeless people to approach her so as not to appear rude. She says she discovered how hurt they all were about how people judged them on the streets. “During the project, I learned about many difficulties that are faced by those who are homeless”, she says. “However, I learned more than just their stories, I also gained important skills along the way, in particular, how to overcome challenges and solve problems. My biggest takeaway from this project is to treat everyone with respect because we don’t always know why they ended up in the situation they are in”. The self-published 54-page book of interviews is available at Meadowridge School library. As the interviewees didn’t want to show their faces, Alice illustrated the book with symbolic photographs to represent their experiences and highlight the differences between those who have homes and those who don’t. The interviewees’ stories often surprised her, particularly one man who was a former engineer. “He ended up on the streets due to drinking and mental health issues, and he stayed there for more than 10 years”, she says. “It was already surprising to see an engineer homeless, however, what shocked me the most was how quickly his life fell apart, and it made me realize how close we all could be to living without a home”. “During my interviews, it was important for me to be open-minded because I am exploring a topic I know very little about. I cannot bring any prejudice into the interviews or else I won’t be able to tell the stories to my readers without being biased. Find out more about the IB learner profile. We invite IB students of all ages to showcase their projects and work to devise solutions to some of humanity’s greatest challenges—for new projects or those you’ve already completed—and share them online using #generationIB. For more information, visit www.ibo.org/50years/this-is-generationib.